As we head to the polls this month, it seems only appropriate to feature a pioneering Modesto designer who invented an early 19th century voting machine. 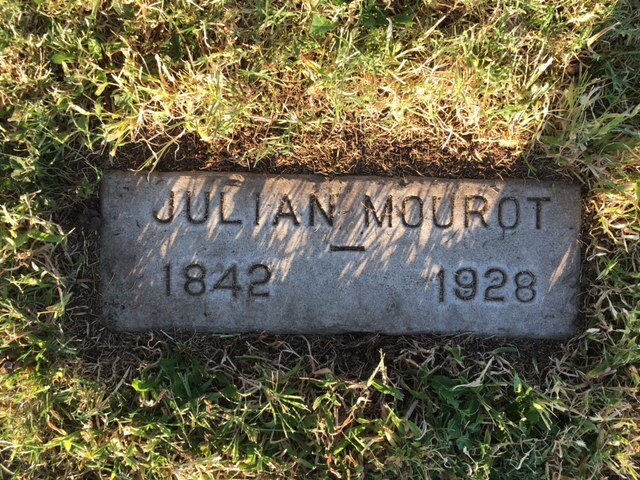 I ventured out on a chilly autumn morning to the Modesto Pioneer Cemetery to find the gravestone of celebrated Modesto architect and inventor, Julian Mourot. The stone was overgrown with weedy grass but Mourot’s legacy remains unsullied as one of our city’s most prolific designers. He was born in 1842 in Illinois and studied with a leading architectural firm there before settling in Modesto in 1879 until his death in 1928. Those familiar with Mourot’s work tend to focus on his architectural achievements, which were many. He is most recognized for his ornate and elaborate Queen Anne-style buildings, among them several Modesto business blocks, a hotel, a hospital, a school, and multiple residencies. 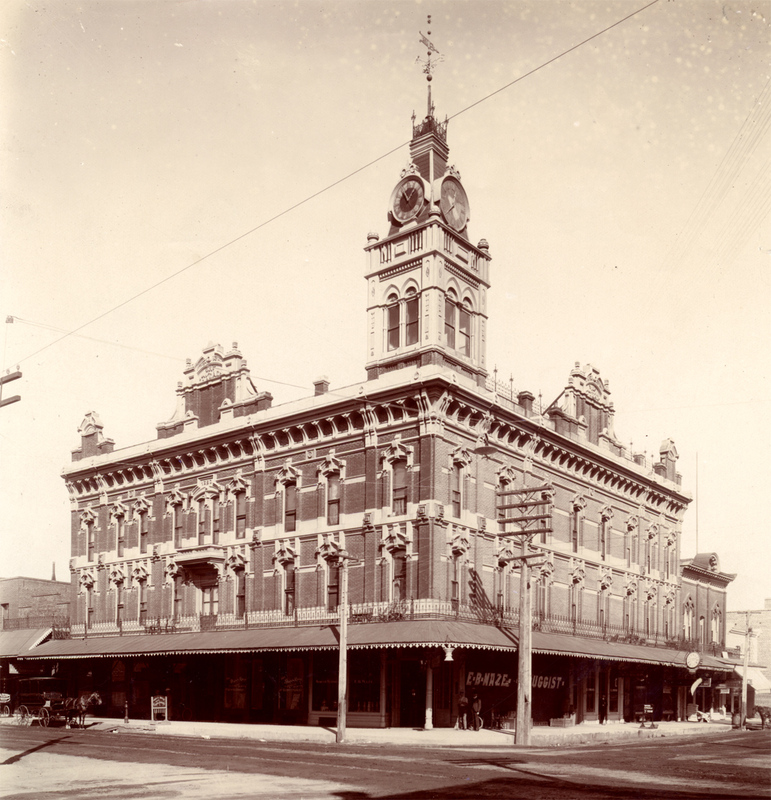 He designed the majestic Tynan Hotel (later the State), completed in 1890 at the corner of 10th and H Street, with its iconic, ornate clock tower and Modesto’s first elevator. 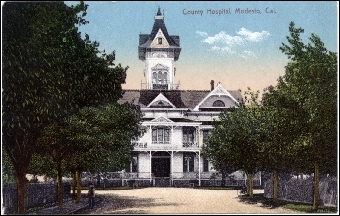 Mourot also designed the Stanislaus County Hospital and Almshouse in 1892 (a commission he competed for against fourteen other leading architects across California, a testament to his creativity and skill). Sadly, all of Mourot’s Modesto buildings have been demolished. Only a landmark residence he designed for a surgeon (from Modesto) in Pacific Grove remains. Beyond being an accomplished architect, Mourot was also a prolific inventor. 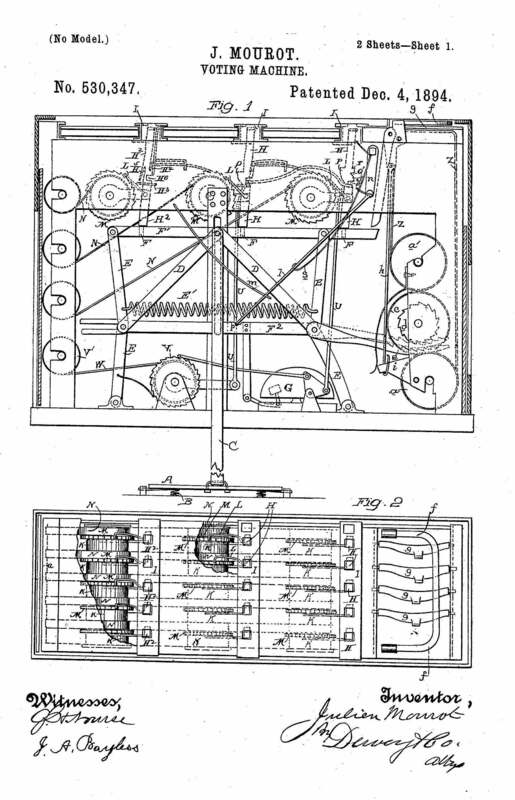 In 1893, he filed a patent for an innovative “Voting Machine.” His detailed description indicates a complex engineering mind highly aware of the voting zeitgeist of the late 19th century.His mechanized secret ballot system employed a series of “pitmen” enabling the voter to depress them and thus cast a vote, and then locking to prevent any further operation until the voter left the booth and another entered. A movable floor mounted upon returning springs enabled the machine for voting when a voter stepped on it. The machine had an intricate series of rotating drums that turned and advanced paper rolls with a voter’s selection, thereby maintaining secrecy, while automatically counting both the number of votes and the number of voters. It’s uncertain whether Mourot’s invention was ever realized. He’s not cited in any histories of voting technology. But what is most impressive about his invention is the timing.The concept of “secret ballot” voting was only introduced in 1888 in the United States after the widespread fraud reported in the contentious presidential election of 1884. In 1892, the first mechanical lever-voting machine was introduced to reduce the risk of dishonest vote counting. Mourot’s patent, filed only a year later, represented truly cutting edge technology. While duplicitous politicians continue to make false and already debunked claims of massive voter fraud in California and across the country, we can celebrate our local design ancestor who pioneered early voting technology to protect our most fundamental democratic right. So cast your vote with civic design pride on November 7th.